The Christian Fellowship Church is a small congregation meeting in the Village of Lucky Lake, Saskatchewan in the Canaan Rural Municipality no. 225. It is about 150 km south of Saskatoon and by road about 30 km northeast of Beechy. The Christian Fellowship Church worships as a community church with only a small number of members from a traditional Mennonite background. In 1905 several Mennonite families from Minnesota and North and South Dakota pioneered on farms in the area. Later a few more came from Manitoba and then in the 1920s a number settled, having fled the Soviet Union. At first these families had little opportunity for organized worship but in the early 1920s the Saskatchewan Mennonite Brethren Conference occasionally sent pastors, Reiseprediger, to conduct services in homes -- John Wiens from Beechy, Peter Unger from Swift Current, and John Nickel from Main Centre. Around 1940 the Herbert Bible School sent out students from under the auspices of the Western Children’s Mission. These student workers began with Vacation Bible School in the summer and encouraged local worship activities. This service invigorated the participants who began worshiping in houses. The Mission secured the services of Jake S. and Lena Adrian who conducted the first Lucky Lake worship service on 15 April 1945 in the home of Abe Quiring. A girls choir was also started at this time. The Adrian family moved into a farm house owned by Cornie N. Quiring, but in July while the family was at camp their house was destroyed by lightning. The congregation responded by purchasing a house in the Village of Lucky Lake. With the pastor living in the village worship services began to be held in several village buildings. On 7 September 1947 the congregation organized as the Western Children’s Mission Church of Lucky Lake with 11 members. Jake Adrian served as pastor. In time the congregation developed Sunday School and youth programs, choirs and a Ladies group. In 1949 the Valleyford School building was purchased, moved onto two village lots and renovated. The dedication service was on 25 September 1949. In 1986 this old building was moved away and new larger and more functional building constructed with its dedication held on July 1986. The Church changed its name to Mennonite Brethren Mission Church, Lucky Lake about 1952 when the Saskatchewan Conference took over the Saskatchewan activities of the Western Children’s Mission. Another name change occurred in 1965 when it was decided the church had grown beyond being a mission church and it changed its name to Mennonite Brethren Church, Lucky Lake. From the congregation’s beginning it received a modest subsidy from the Saskatchewan Conference and this continued until the early 1970s. In 1969 economics and pastor shortages led the Lucky Lake and Beechy Mennonite Brethren churches to combine their resources in calling one minister to serve the two congregations. Though this turned out to be workable it was not altogether satisfactory. Ed Epp and then Ed Giesbrecht pastored the two congregations for the next seven years and both lived in Beechy. In 1976 Lucky Lake called Ken Sperling to serve as pastor and he served until 1980. It was during this time that the congregation again changed its name to Christian Fellowship Church, Mennonite Brethren, Lucky Lake, reflecting the change to a congregation that encouraged all community members to participate in their worship. A special 50th anniversary celebration was held on 19-20 July 1997. Penner, Peter. No Longer at Arm's Length: Mennonite Brethren Church Planting in Canada. Winnipeg: Kindred Press, 1987: 65. Available in full electronic text at: https://archive.org/stream/NoLongerAtArmsLengthMBChurchPlantingInCanadaOCRopt?ref=ol#mode/2up. Sperling, Ken. "History - Christian Fellowship Church Mennonite Brethren, Lucky Lake." In History of Lucky Lake, 1919-1980, edited by Fanny Jordbro. Lucky Lake, SK: Fanny Jordbro, 1980. Wiebe, Victor G. "Lucky Lake Christian Fellowship Church (Lucky Lake, Saskatchewan, Canada)." Global Anabaptist Mennonite Encyclopedia Online. October 2014. Web. 21 Apr 2019. http://gameo.org/index.php?title=Lucky_Lake_Christian_Fellowship_Church_(Lucky_Lake,_Saskatchewan,_Canada)&oldid=163624. Wiebe, Victor G. (October 2014). 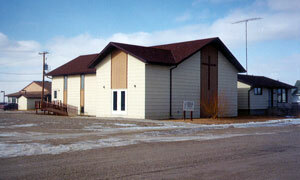 Lucky Lake Christian Fellowship Church (Lucky Lake, Saskatchewan, Canada). Global Anabaptist Mennonite Encyclopedia Online. Retrieved 21 April 2019, from http://gameo.org/index.php?title=Lucky_Lake_Christian_Fellowship_Church_(Lucky_Lake,_Saskatchewan,_Canada)&oldid=163624.